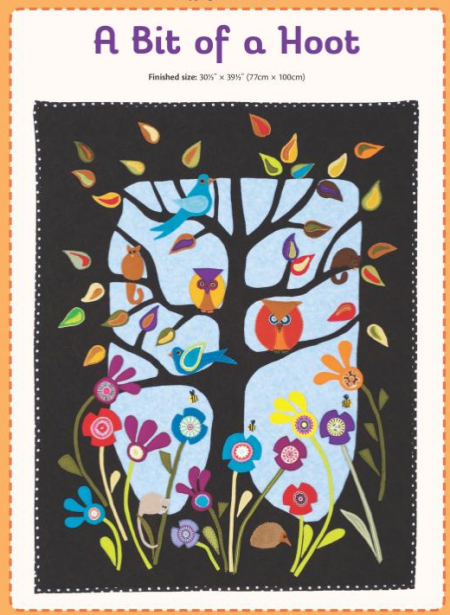 There are some fantastic appliqué classes offered at each of these. 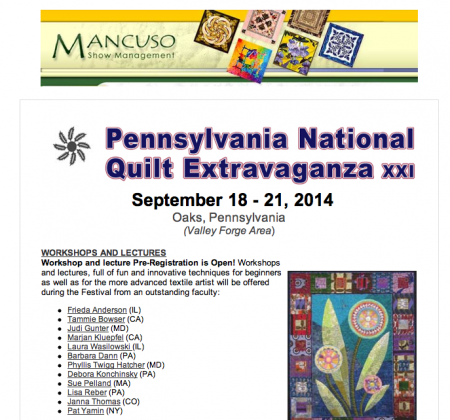 I’ll be at both Oasis and PIQF, in the merchant mall. Oasis is new this year, and we all have our fingers and toes crossed that it will be just as big and bustling and exciting as PIQF. 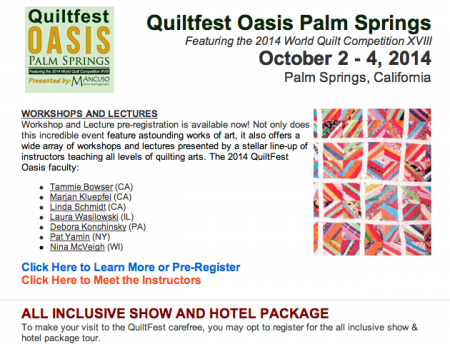 Heavenly heaven for the quilter. The lucky reader who won Wild Blooms & Colorful Creatures was No. 32, Margaret! The book is on its way to you now, Margaret, have a wild and colorful time with it!! And my thanks to all of you who follow this blog. When you enter these drawings, it lets me know you’re out there, and you’re a fellow appliqué enthusiast, and I appreciate it so much. 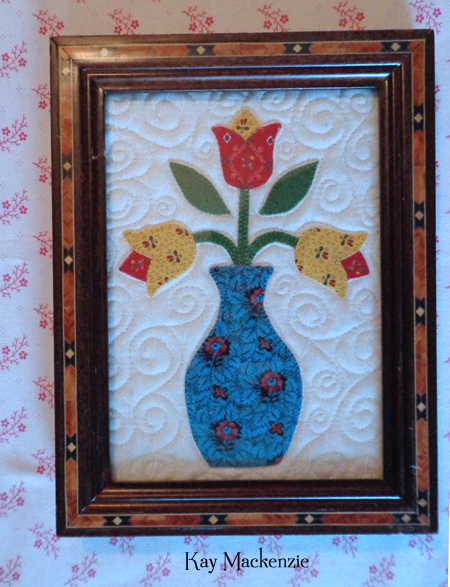 I’ve been having a fabulous time making more framed mini-quilts. Here are a couple of them. It’s a whole lot o’ fun. 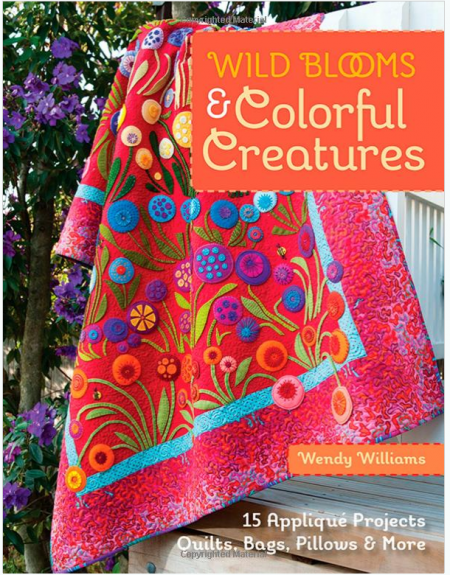 Our featured book this month, courtesy of C&T Publishing, is Wendy Williams’ Wild Blooms & Colorful Creatures. 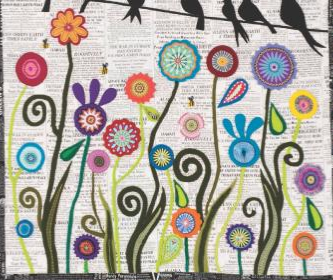 I’m wild about these colorful blooms and creatures! This book is all about combining our traditional cotton prints with wool and linen, to add a new dimension. 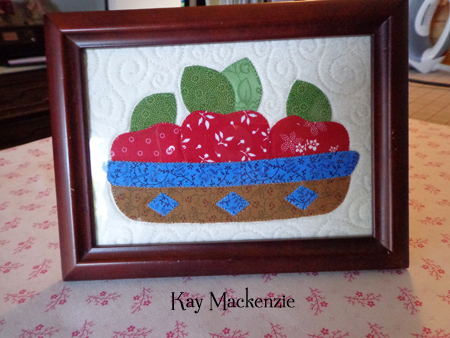 Wendy starts out with a section on appliqué basics that gives information on wool, wool felt, threads, templates, and her style of needle-turn that uses a running stitch close to the turned edge. 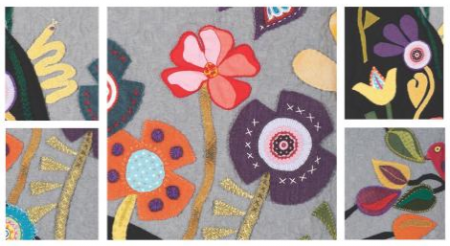 There’s also a whole page of illustrated embroidery stitches for adding special touches. Then on to the projects! 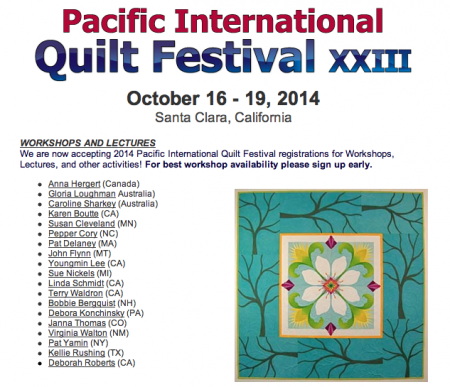 There are wall quilts, runners, pillows, bags, and sewing notions galore. 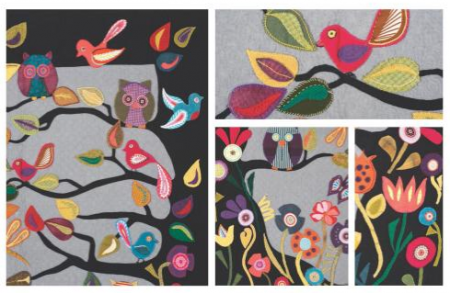 All of the appliqué templates are printed at full size, and there’s even a pull-out section for the larger designs. Always a bonus! Aren’t the designs wonderful? Such a fearless sense of color and whimsy. If you’d like to win this book in a random drawing, please leave a comment before 7:00 p.m. California time on Tuesday, August 5. Notice how I said “leave a comment”…? This is not the same as replying to your email feed. You’ll need to get out of your email program by clicking on the title of the post, which will bring you to the blog itself on the internet, and leave your comment there. Open to U.S. mailing addresses only. Good luck all! !